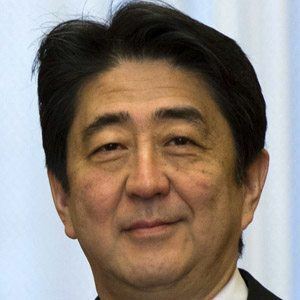 Affiliated with his country's Liberal Democratic Party, this Japanese politician took office in 2006 as Prime Minister and began his second term in late 2012. Before becoming Prime Minister of Japan, he served from 2005 to 2006 as the Japanese Government's Chief Cabinet Secretary. After earning a degree in political science from Seikei University, he briefly studied public policy at the University of Southern California. He later worked for Japan's Kobe Steel Corporation. In the early 1990s, he served the Yamaguchi Prefecture constituency in the Japanese House of Representatives. His maternal grandfather, Nobusuke Kishi, served as Japanese Prime Minister during the late 1950s, and his father and paternal grandfather were also politicians. In 1987, he married Japanese socialite Akie Abe. He served as Prime Minister of Japan during the reign of Emperor Akihito.